Raw food intrigues me but I have no experience at preparing it. I have checked out books at the library for beginners, I have read menu’s from raw restaraunts, have been reading the amazing raw food blogs on the vegan MOFO blogroll and I have tried food that others have prepared and it seems exciting and healthy but to do it right also sounds time consuming. If I didn’t work fifty hours a week and my husband was on board to learn how to prepare raw food I think I would incorporate into my life, but honestly my laziness prevails. Last week I was hosting a party and made a shout out looking for a dill dip recipe for my veggie tray. 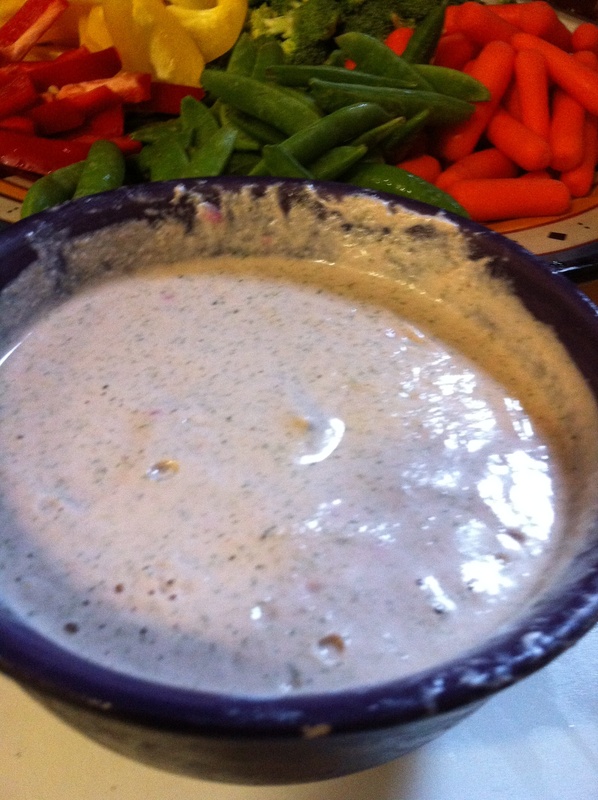 Our Facebook friend Nicholas sent me a link to Uncooking 101 for a Creamy “Better Than” Ranch recipe. I made it only making a few changes do to the fact that I had never heard of a few of the items and it turned out amazing. As you can see mine came out much runnier than the dip pictured on Uncooking 101 but it was still great. I made it again this evening to see if it would thinking, but no luck. My hubby was really happy because he like it on his salad just as it was. Be warned, the fresh garlic gave it quite a bite and the little vegan didn’t care for it though it did mellow out on day two. I followed the directions for preparation. Oh so good. This is definitely a new staple in our household! Ooo it looks good! raw food intrigues me too but I haven’t gone down that road yet. I loved the uncooking 101 and I think I will check out more recipes on there. It has been fun checking out all the raw foods on the blogroll also. Yeah, you think raw would be easier than cooking but the unknown scares me. Your smoothie sounds delicious! Pretty sure the Irish moss is for texture, not flavor – it’s a thickener, which is why your dip is runny. You could maybe use arrowroot or potato/cornstarch to thicken it up if you want it more dip-like and less salad dressing-like.